Real Madrid and Valladolid are set to go head to head on Saturday in La Liga as the season moves ahead. Real Madrid go into this game as the favourites. Real Madrid are in not so good form at the moment and they will look to quickly return to winning ways. Los Blancos are currently far behind in the race of La Liga title. Los Blancos at the moment are ninth in the points table after 10 games with 14 points. 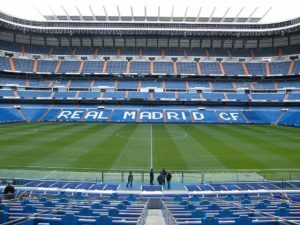 Real Madrid know that on Saturday they will have to play their best football and avoid complacency against Valladolid. Los Blancos have their next three games in La Liga against Celta Vigo, Eibar and Valencia. On the other hand, Valladolid have had a good start to their 2018/19 La Liga campaign. They will look to continue playing positive football. Valladolid at the moment are sixth in the points table after 10 games with 16 points. It will be a tough game they know against Real Madrid away but they will look to give their all and hope for the best. Real Madrid have a good record against Valladolid and they will look to continue the good work. Daniele Verde is available for Valladolid and will likely play on Saturday. As for Real Madrid, Marcelo will be unavailable as due to injury. Valladolid XI : Masip, Martinez, Calero, Olivas, Moyano, Villa, Alcarez, Herrero, Regal, L. Suarez, Unal. Real Madrid XI : Courtois, Odriozola, Nacho, Ramos, Reguilon, T. Kroos, Casemiro, L. Modric, Isco, Benzema, Bale. It should be a good game as both teams will give their all but in the end I expect Real Madrid to get the job done and earn three points.